Photo I.D. and/or proof of residency required. 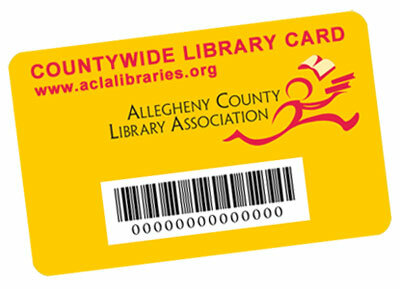 Use in any Allegheny county library. Adults and children, no age limit. You may only have one Library card at a time. If a card is lost, a replacement card may be issued for a fee. Cards may not be issued to third parties. You must be present to sign your Library card. Applicants must have proof of identity and proof of residency. Current driver’s license is preferred, but the Library will accept a utility bill, lease, etc. accompanied by photo identification. You can renew your items 2 times. If an item is checked out or located at another branch, you can place a hold and have it sent to the location of your choice. We will notify you when the item is available for pickup and place it on our hold shelf for seven days. You may have up to 30 active holds on your library account at any given time. Call us at 412-882-6622 during library operating hours. Please note: fines over $2.00 can be paid online with a credit card by going to My Account page. A PIN number must be created to access an account online. Follow the instructions given on the screen or stop by our front desk for help.